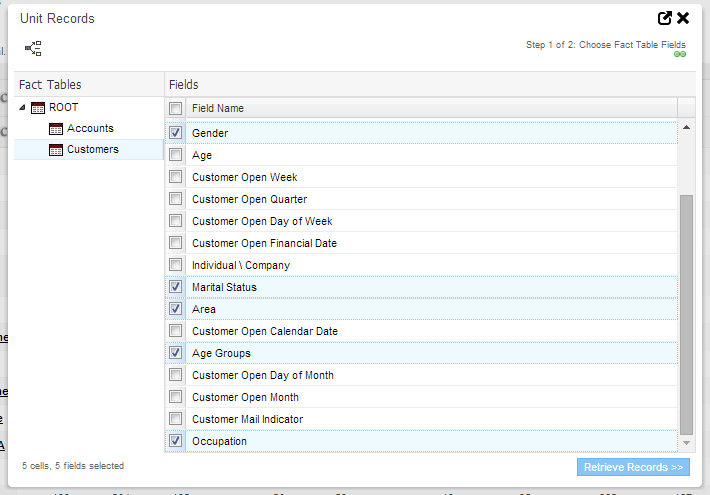 One of the key strengths of a SuperSTAR database is the inclusion of unit record data. 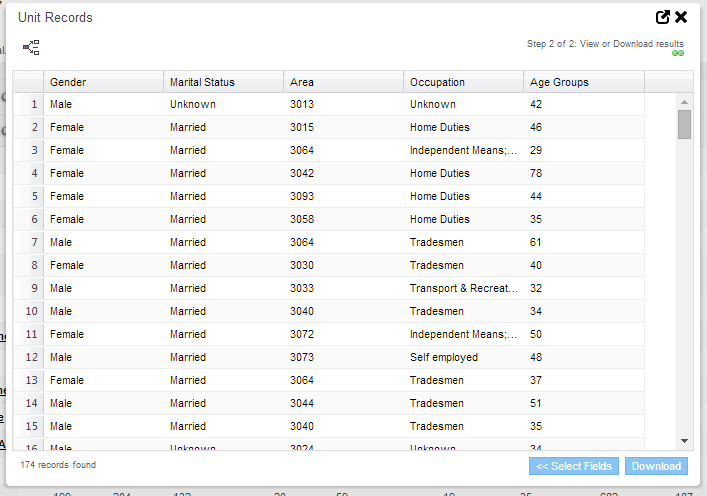 The Record View feature lets you view and download the individual unit records that make up the values in the table. You might want to use this feature for auditing and verification purposes, or you can use it to create a marketing campaign to target specific customers. When is Record View Available? Record View is only available if the administrator has enabled Record View access on this database and enabled the Record View feature in the SuperWEB2 configuration, and if you are connecting to an SXV4 database that contains unit record data (Record View will not be available if you are viewing an SXV4 cube, as this only contains aggregated data). 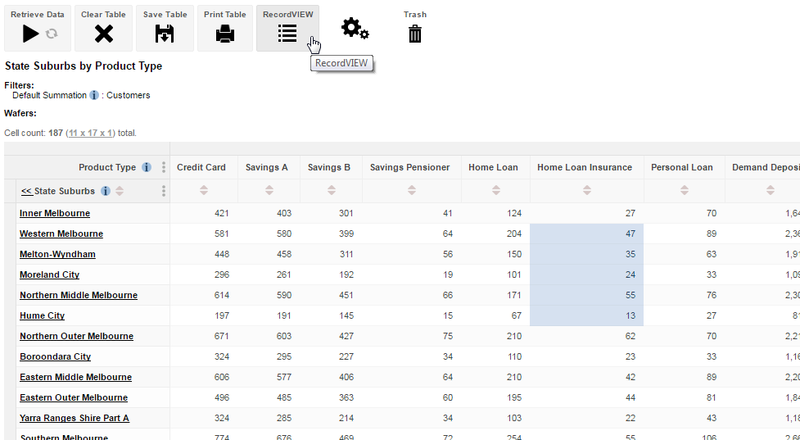 If you have access to the Record View feature you will see the RecordVIEW button at the top of the table area, and when you move the mouse pointer over the table cells it changes to a cross. 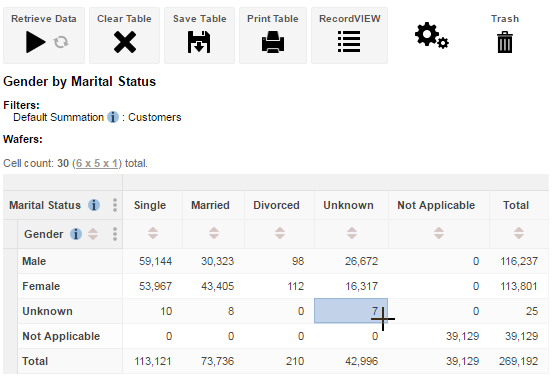 Create your table and run the cross tabulation to retrieve data. Use this dialog to select the fields you want to see in the downloaded records: select from the fact tables and groups in the list on the left to see the available fields, and then select the check boxes for each field you want to download. 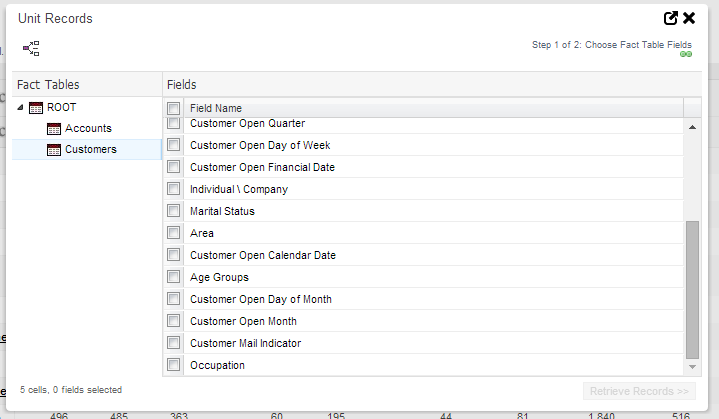 You can include fields from multiple fact tables and groups. The Unit Records dialog displays the number of records returned in the bottom left corner. This may not match the count of the cells you selected (for example, if you chose to include fields from a different fact table to the one that was being counted in your table). In this example, the original table was counting records from the Customers fact table, and we selected to only include fields from that table, so the number of records returned by Record View matches the total count of the selected cells (47 + 35 + 24 + 55 +13 = 174). However, if we had chosen to also include fields from the Accounts fact table, then we might potentially get a different number of records returned (because each one of those customers can have more than one account). You can now choose to either change the field selection (click << Select Fields) or download the data in CSV format (click Download).